Back in 1991 the BBC visited Los Angeles to ask if it was the city of the future. Their answer? Yes, but not in a good way. As someone who moved to L.A. back in 2010, the city I see in this BBC special is a portrait of dystopia that's rather unfamiliar to me. Is Los Angeles a dreadfully sun-soaked hellscape awash in cars and dripping with cynicism? Sure. But it's a remarkably different dystopia than was predicted in 1991. Boing Boing's Colin Marshall first spotted this documentary on YouTube and points out that in 1991 the city had yet to see the riots of 1992 and the Northridge Earthquake of 1994. A lot has changed since those days in the ealry 1990s. I spoke with Marshall last summer for his podcast Notebook on Cities and Culture where we talked about the various dytopias of Los Angeles. The city of L.A. was an entirely different beast in 1991 than it is here in the early 21st century. 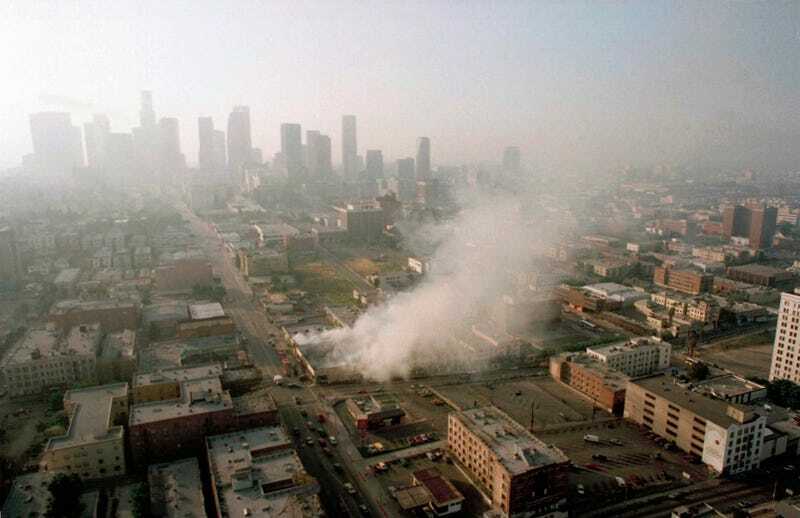 The smog, the gang violence, and the gated nature of L.A. have ebbed and flowed during the last 25 years. These things all still exist, but their effects are nowhere near as crippling to the human spirit. Our modern dread is one that is perhaps harder to pin on external forces within the city. The BBC episode looks like the city of the 1993 anti-hero movie Falling Down. Whereas the true dystopian vibe of L.A. today might be closer to The Jetsons meets Blade Runner — one part cartoonish Space Age romanticism, two parts high-tech crime thriller. By the end of the documentary there's no mistaking what the BBC thinks of Los Angeles and the future it represents. And it's not terribly kind in its assessment, even if it's just a "debate." "Meanwhile, the debate continues about whether the California Dream will become a postmodern nightmare," the narrator says ominously.